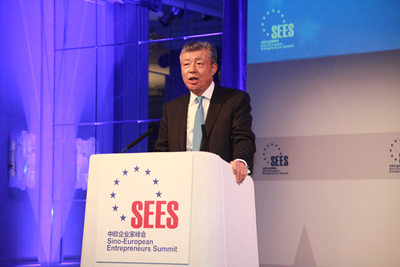 On June 14, Ambassador Liu Xiaoming was invited to attend the opening ceremony of the Eighth Sino-European Entrepreneurs Summit (SEES) and delivered a keynote speech entitled Entrepreneurship Will Push China-Europe Cooperation to a New High. Former British Prime Minister Gordon Brown, former French Prime Minister Jean-Pierre Raffarin and more than 300 business representatives from China and Europe attended the ceremony. Ambassador Liu first highly commended the contribution SEES has made to advancing China-Europe and China-UK friendship and cooperation. He pointed out that, at present, the world is undergoing profound changes, and a new round of scientific and industrial revolution is around the corner. Against this backdrop, this year's summit cannot be more timely, and will significantly contribute to stronger cooperation between China and Europe, and between China and Britain. Ambassador Liu noted that, in spite of the complicated and ever changing current international and regional situations, his confidence in China-Europe and China-UK business cooperation remains unchanged. He listed three main reasons for his confidence. First, China's economic growth has maintained a steady and positive momentum. As the fundamentals of China's economy remain positive in the long run, and China's door will open wider to the world, there will be a vast market and huge opportunities to Britain, to Europe and to the rest of the world. In particular, the Belt and Road building will help make global growth more vibrant and inclusive and deliver more benefits to people around the world. Second, China-Europe relations are becoming increasingly mature and steady. For China, the EU has long been the largest trading partner, the biggest source of technology, and an important origin of foreign investment. For the EU, China is the second largest trading partner. China-Europe economic and trade cooperation enjoys great potentials and bright prospects. Third, China-UK relationship is full of highlights. China-UK business cooperation remains firmly grounded and enjoys a strong momentum. The Ambassador hopes that the two sides will seize the historic opportunities to form a stronger synergy between their respective development strategies. Under the Belt and Road framework, China and Britain can join hands for trilateral cooperation in a third country, which could well be a new growth point of the Belt and Road building. Ambassador Liu said that, as Britain is expected to start Brexit negotiation with the EU soon, China will always respect the choice of the British people and approach its cooperation with the UK and the EU from a long-term, strategic perspective. He also expressed his hope that the negotiation between Britain and the EU will result in a win-win agreement that facilitates common development. 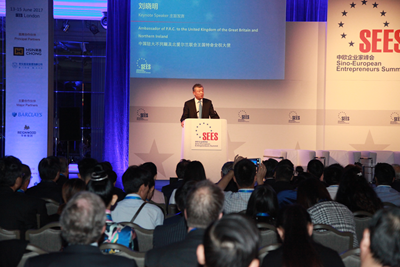 He encouraged the business leaders from both China and Europe to keep up the spirit of entrepreneurship advocated by President Xi Jinping, tap into the market vitality, deepen communication and cooperation, and contribute to pushing China-Europe and China-UK business ties to a new high. 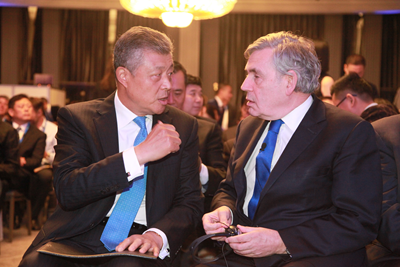 In his speech, former British Prime Minister Gordon Brown said that, with the rapid development of science, technology and social media around the world, both business models and international relations are in a stage of adjustments and changes. In this context, more dialogues between European and Chinese entrepreneurs are particularly important. Because of the major events in Britain in recent years from the Brexit referendum to the general election that has just ended, Britain is undergoing political and social changes. However, the UK remains determined to build the strongest possible relationship with China. China's achievements in reforms and opening up in the past 30 years have been obvious to all and serve as an important reference for other countries. China is now moving towards a consumer-driven and innovation-oriented economic structure, and this will provide more opportunities for China and the world. In particular, the Belt and Road Initiative has brought great business opportunities for Europe-China and UK-China economic and trade cooperation, and the two sides enjoy bright prospects in infrastructure construction and the development of third-party markets. The steady progress in the RMB internationalization will also help London to consolidate its status as a financial centre. Britain and China should continue to strengthen cooperation, learn from each other, and establish ever closer economic and trade ties. Former French Prime Minister Jean-Pierre Raffarin said in his speech that he attended the Belt and Road Forum for International Cooperation in person. The Belt and Road Initiative embodies the values of innovation and cooperation, and is of significant importance to the world in coping with new challenges together. Europe-China economic and trade cooperation is very important to facilitating sustainable development and creating new development opportunities. The entrepreneurs on both sides should join hands to lead the trend of social development. The participants had in-depth discussions on the prospects of China-Europe economic and trade cooperation, finance and innovation, and cooperation in cultural industries.